Sofitel So Bangkok - A luxurious welcome back to Bangkok The misadventures of a restless photographer. Travel photographer and travel blogger, Tracie Howe, wanders the globe seeking out new adventures and photo opportunities to blog about. Join her for a unique perspective on travel, travel photography, and travel tips. 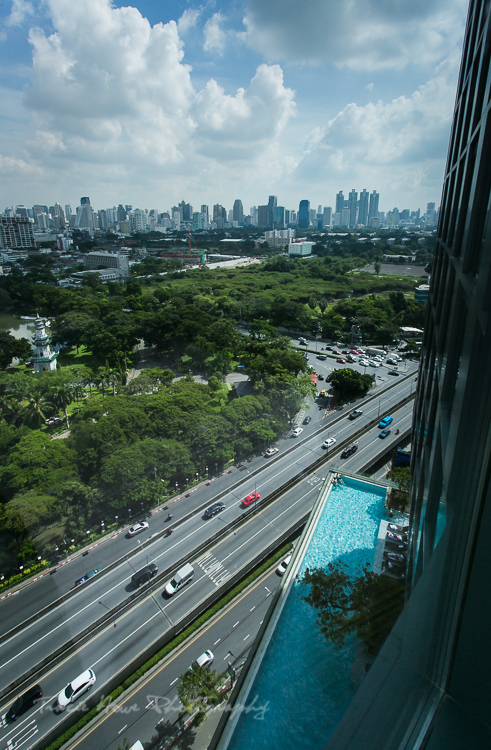 The view of Lumphini Park and Bangkok’s skyline from my room at Sofitel So Bangkok. I was here about a decade ago and I’m just so happy to be back. TBEX Asia was happening in Bangkok, so I used that as an excuse to head back to one of my favorite areas of the world and kick off another Southeast Asia journey. 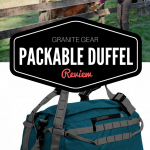 As I start this next adventure, I realize that I have become a “flashpacker” – a step above my younger days of backpacking. I’ve done the long bus rides and the hostel dorms, and now I’m ready to upgrade to a bit more comfort. 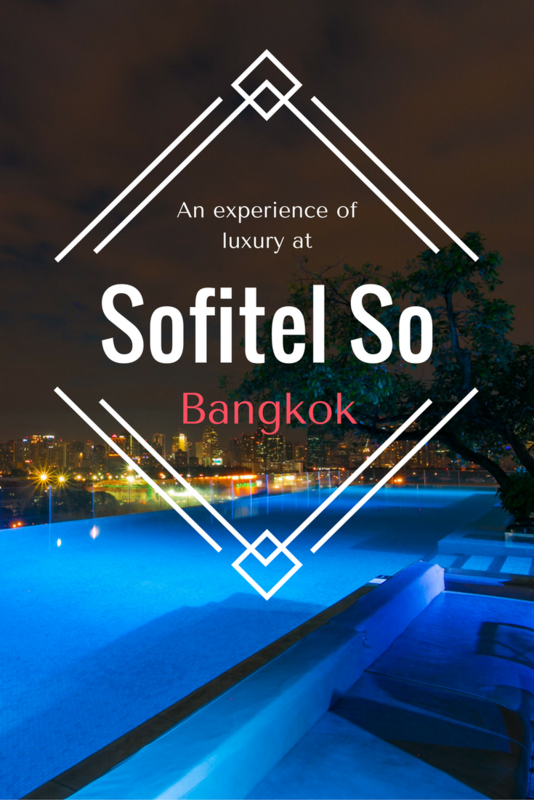 The comfort that I experienced at Sofitel So Bangkok, however, was beyond anything I expected when I contacted them about launching my trip with a review of their hotel. Yes, it is a luxury 5 star hotel, so maybe I should have known. I’ve photographed weddings and events in fancy hotels before and I’ve worked in the luxury cruise industry, but this was nothing like what I was used to. Sofitel So Bangkok has redefined luxury for me. I think I might be in trouble now that I know that such places exist! 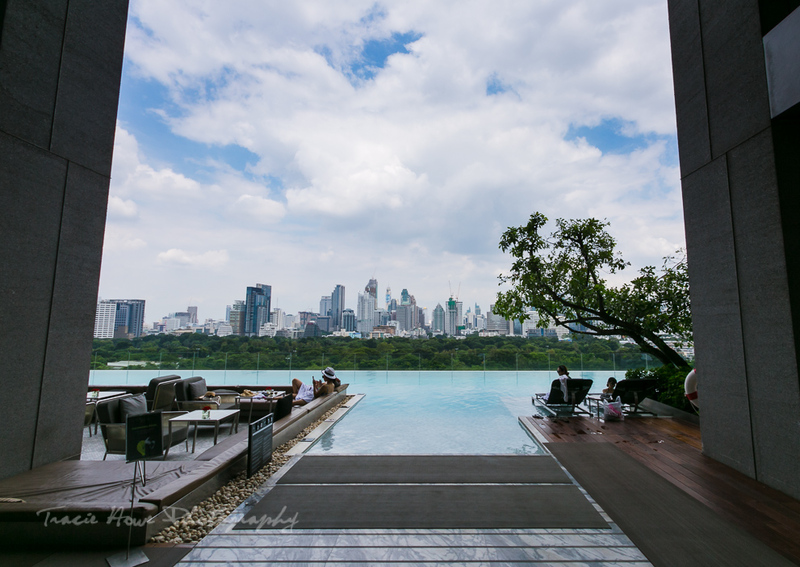 My intention in reviewing Sofitel So Bangkok was to escape to a softer, more refined side of Bangkok that I hadn’t seen in my previous visits. I knew I’d need some of that comfort to recover from my jetlag and to ease into Bangkok. 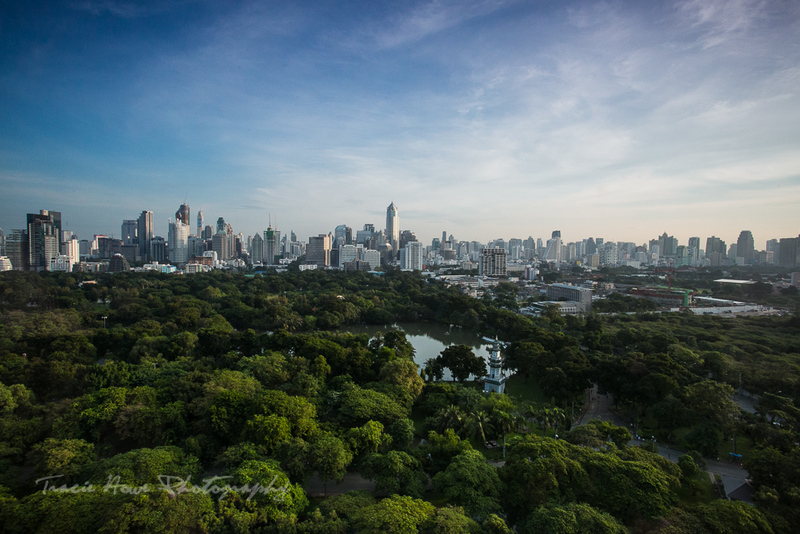 The hotel faces Lumphini Park (like a small Central Park) and the city skyline sparkles beyond that. With photos always in mind, I was looking forward to the spectacular views and the famous infinity pool that shares the same city backdrop. 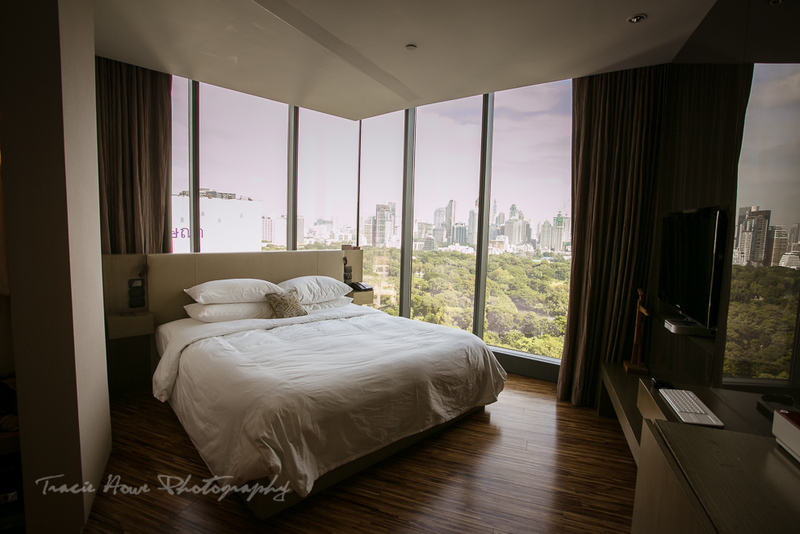 I knew that Sofitel So Bangkok would provide everything that I could want in the way of photographic opportunities, but the personality of this hotel goes well beyond the view that inspires it’s design. 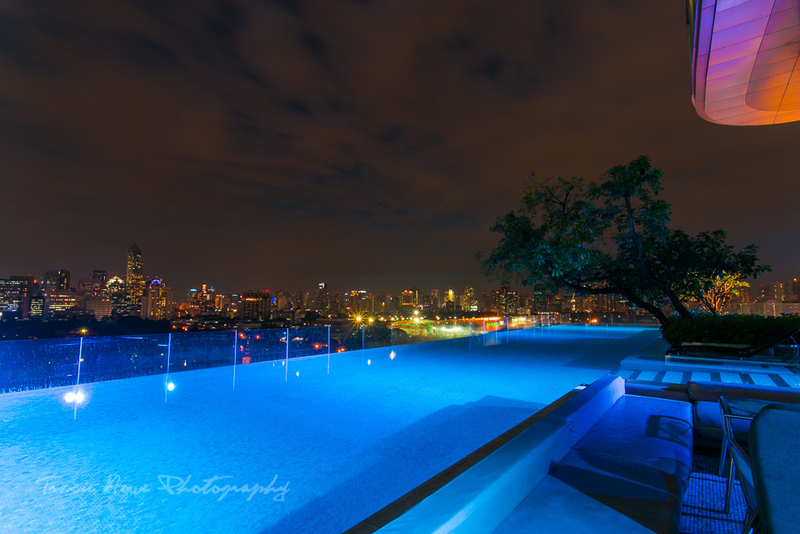 An evening shot of the Sofitel So Bangkok infinity pool. Lovely! Upon entering the street level lobby of this upscale hotel, I felt immediately out of place lugging around my giant backpack. However, I was greeted by the concierge (“city guru”) with friendliness and smiles and no signs of judging. My bags were taken from me right away and set aside to be delivered to my room. I was then escorted to the 9th floor check in lobby and given a welcome drink. I watched as the “Magic Drink” changed from a deep blue to a bright magenta before my eyes! At this point I was already in awe at the level of service and friendliness that I had already witnessed even before checking in. The 9th floor check in lobby and my Magic Drink. A welcome gift left for me in my room! 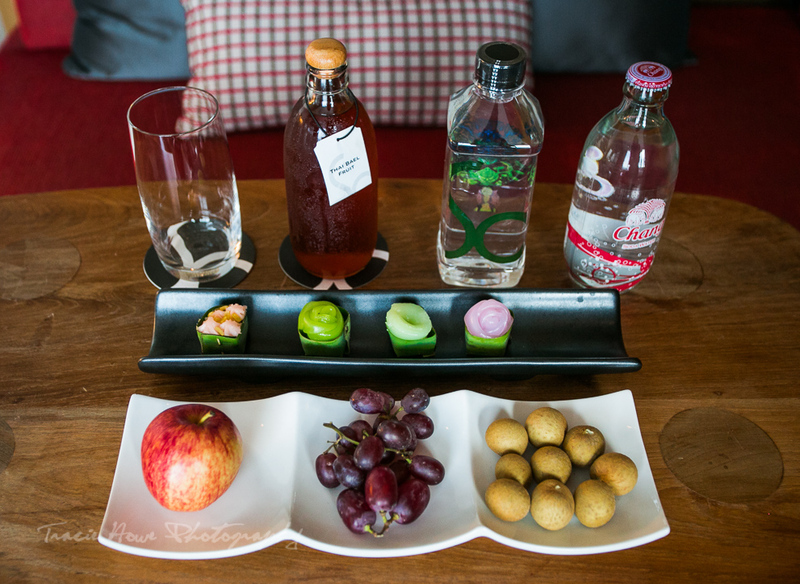 I’m still drooling over those tasty little delicacies and the Thai Bael Fruit drink! Thankfully I was checked in early so I had some time to wander around the hotel a bit on my own. Ever fascinated by pools, I immediately checked that out first. The infinity pool towers above the streets of Bangkok for a refreshing view of the city below. Drinks and snacks are available at The Water Club, making the pool area a popular place. It’s even open to the public for a monthly pool party. The nearby Solarium offers a quieter place to relax if the pool gets too rowdy, though I never saw more than a handful of people swimming. The So SPA and So Fit fitness center complete the wellness experience. Sofitel So Bangkok’s famous infinity pool by day. The high-rise of Sofitel So Bangkok looking up from the 10th floor and the Solarium found on the other side of the building. Later I was given a more thorough tour of the hotel’s public and private areas by my gracious host, Germaine. Sofitel So Bangkok offers spaces for a variety of small and large events, from The Box on the 7th floor to the huge Ballroom on the 8th floor. More exclusive spaces include the Park Society’s SO Moonlit Cabanas, and Club Signature, a private access club for more personalized and exclusive service. 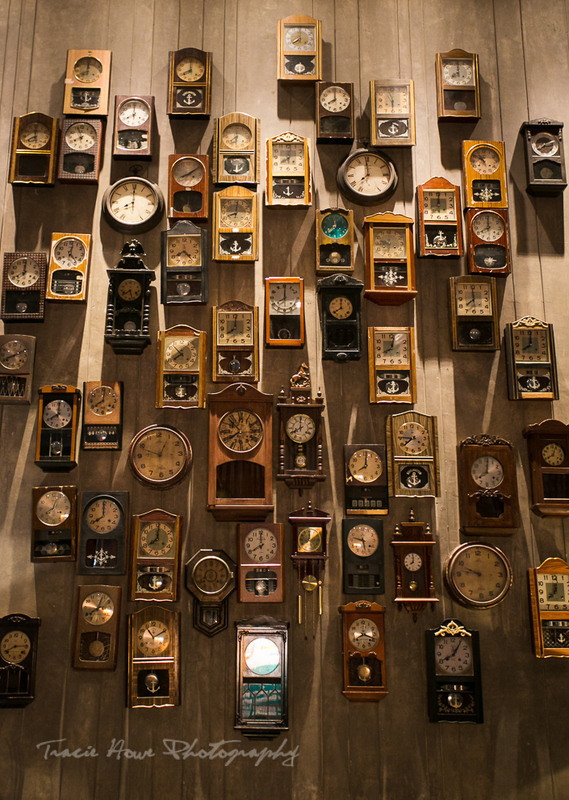 A wall of clocks that struck my fancy. These are found facing the Ballroom. The Park Society Terrace. 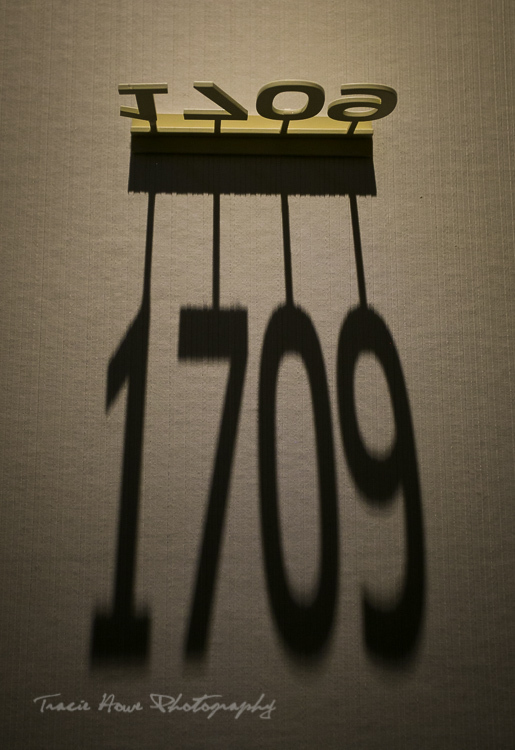 Image provided by Sofitel So Bangkok. There are also a range of food and beverage options available throughout the hotel. You can enjoy an afternoon tea at Mixo on the 9th floor (where I enjoyed my Magic Drink) or a specially crafted chocolate created at the Chocolab located in the lower lobby. The Park Society rooftop restaurant and bar offers an incredible view for dinner and drinks. Sadly, my busy conference schedule meant that I could only enjoy 2 meals in the hotel. Fortunately these included breakfast at the Red Oven restaurant, which I describe more later in the post. Chocolate delights and a giant chocolate drop sculpted from the ceiling of the Chocolab. One of the impressive atriums found by the Red Oven restaurant. There are exquisite spaces everywhere at Sofitel So Bangkok. The entire hotel is a work of art waiting for hungry eyes to take it all in. You can make your way around via two sets of elevators – one set for the upper levels and one set for the lower levels. A little confusing at first, but the elevators are clearly marked, making the hotel easy to explore. 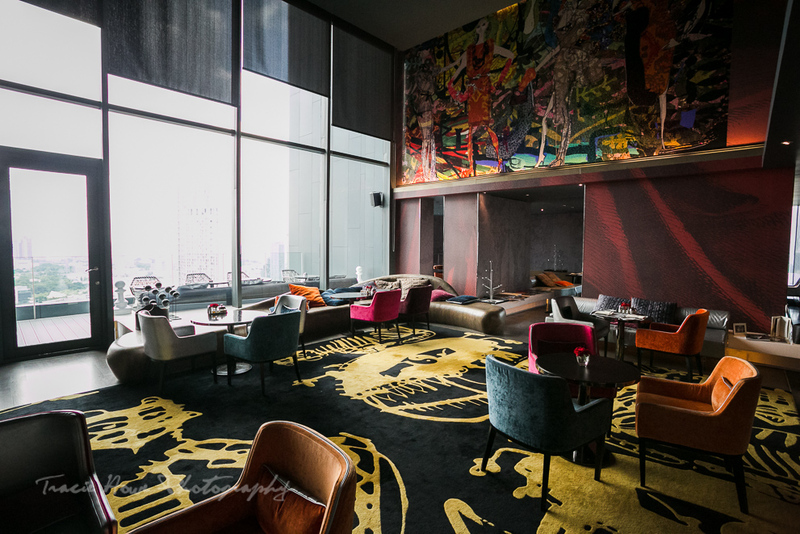 What sets Sofitel So Bangkok apart from others in it’s class is the unique collaboration between artists and designers. French stylist Monsieur Chrisitan Lacroix designed the unique uniforms worn by hotel staff and the hotel’s elaborate tree emblem. 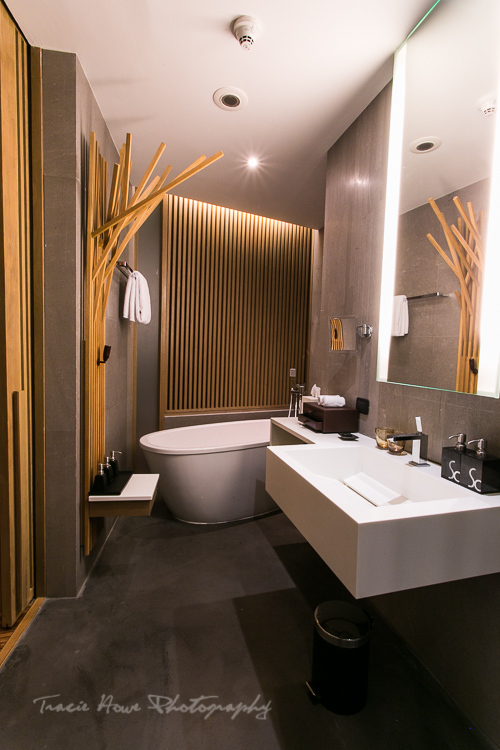 Renowned Thai architect, Smith Obayawat, and 5 other designers are responsible for the element themed interiors. Four of these Thai elements – Earth, Water, Wood, and Metal are found throughout each dedicated section of the hotel and in their respective guest rooms, while the Fire element is represented by the Red Oven restaurant. An atrium featuring a display of all the elements. A variety of elements allows guests to experience the style of their choice. 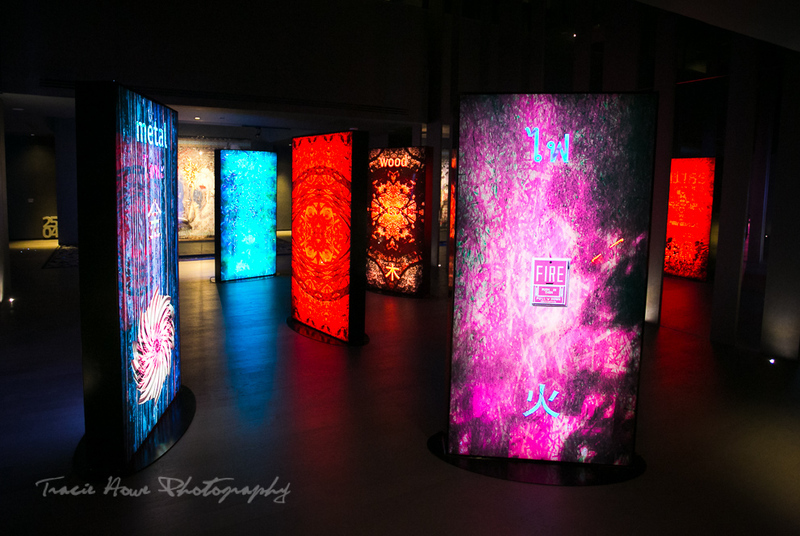 I was able to tour a room for each element and I found each one intriguing in one way or another. However, I was given my first choice, the Wood element, which I believe matched me best. I felt that it was the most calming of all the elements, and as a person not particularly fond of big cities, that is something I needed in Bangkok! When I walked into my room, I was blown away! A practically 180 degree view was the first thing to attract my attention. Once I picked my jaw up from the floor, I began to notice the natural details that emphasized the wood theme – the multi-wood paneled floor, the traditional Thai style teak shutters dividing the bathroom and the bedroom, the earthenware soap dispensers, the stone bathroom floor, and the wooden statue next to the TV. Giant windows provided plenty of natural light to fill the space, accentuating all of the design elements. One of the unique design features of the Wood element rooms. My beautiful SO Comfy Wood element room. Another view from my room! I was impressed by the amount of technology that was seamlessly integrated into the room. My room card activated the electronics and allowed me to notify the housekeeper if I should be disturbed or not. The TV screen (actually an iMac) greeted me by name and offered a multimedia experience with everything from a Skype connection to internet access, in addition to a range of TV channels. A little wooden statue provided a nice touch and the TV welcomed me by name! The window-side bed was as comfortable and inviting as it looks. What I was surprised by was how comfortable the bathtub was, with a shape that curves to your body. The shower was a lovely alternative as well. Robes and slippers were provided, as were as many toiletries as you could think of to make your stay a little more comfortable. An evening shot of my room. I was happy to find that Sofitel So Bangkok is very eco-conscious. I loved relaxing in this bathtub! Every element has it’s own group of adjacent floors. Within each element group there are eight categories of rooms and suites – So Comfy, So Cozy, So Club, So Studio, So Suite, So Suite Spa, So Lofty, and So VIP. I stayed in a So Comfy room. Each element’s atrium displays a work of art that fits the theme. 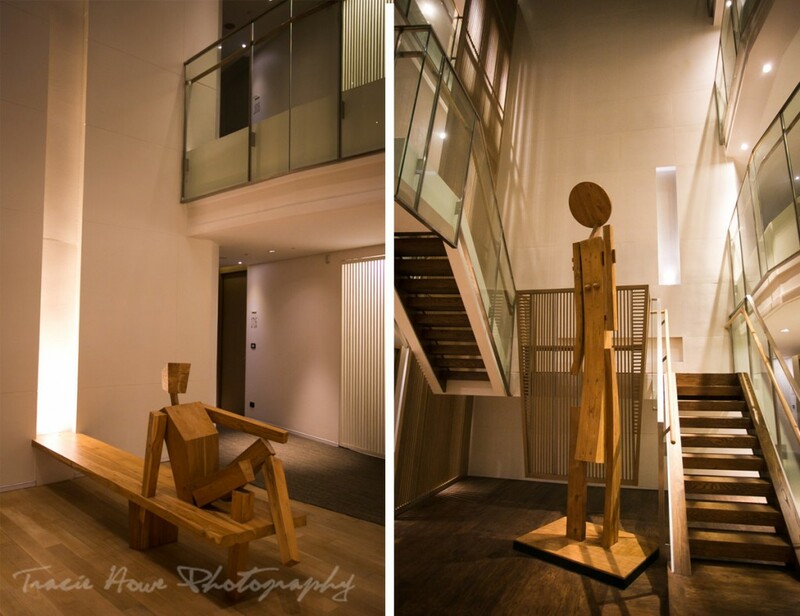 Sculptures featured in the Wood element atriums. During my tour of the other element rooms, I discovered a unique feature in each that caught my interest. In the Earth element, I found the curved walls and arched doors to be particularly appealing. In the Metal room I appreciated the sleek, modern look. And I desperately wanted to take a bath in the tub of the Water element room! 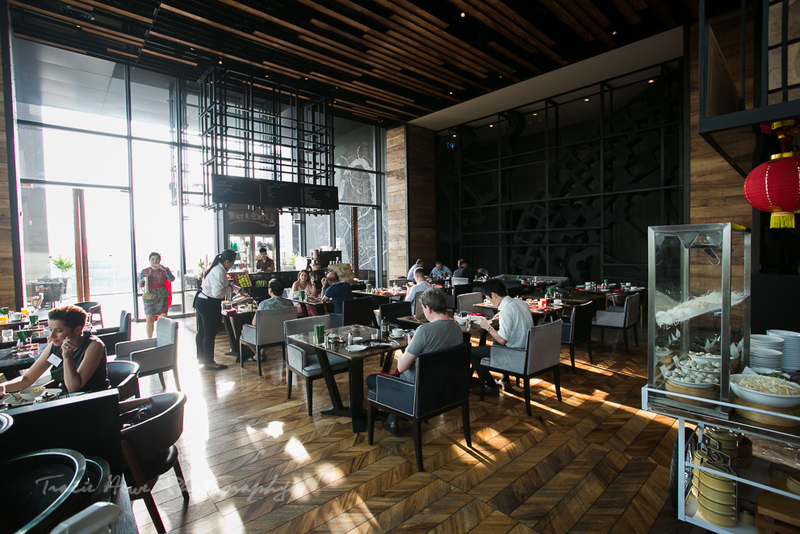 Inspired by Bangkok’s flaming sun, the Fire element is represented by the Red Oven restaurant which prominently features a giant oven. A part of the oven was so big that it had to be brought through the windows upon installation! This restaurant is a “market-style” buffet, offering a seemingly endless variety of scrumptious cuisines from around the world. Breakfast was included with my stay and after two days I was only able to sample just a few of the selections. The food was delicious and the cafe within the restaurant provided wonderful coffee drinks of your choice. The Red Oven also serves lunch and dinner. 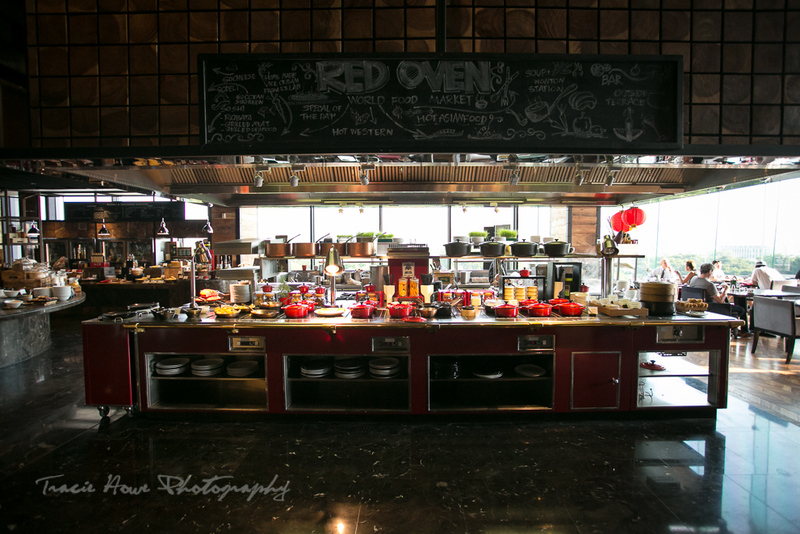 The Red Oven restaurant’s giant French Molteni Oven. 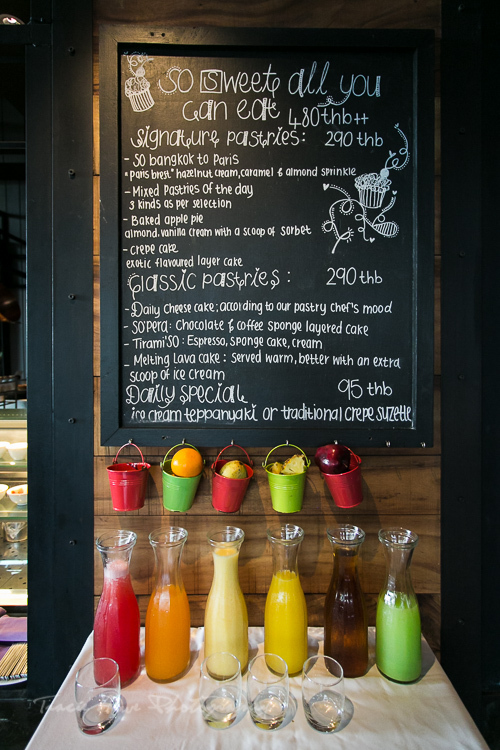 A variety of fresh juices available at the Red Oven. 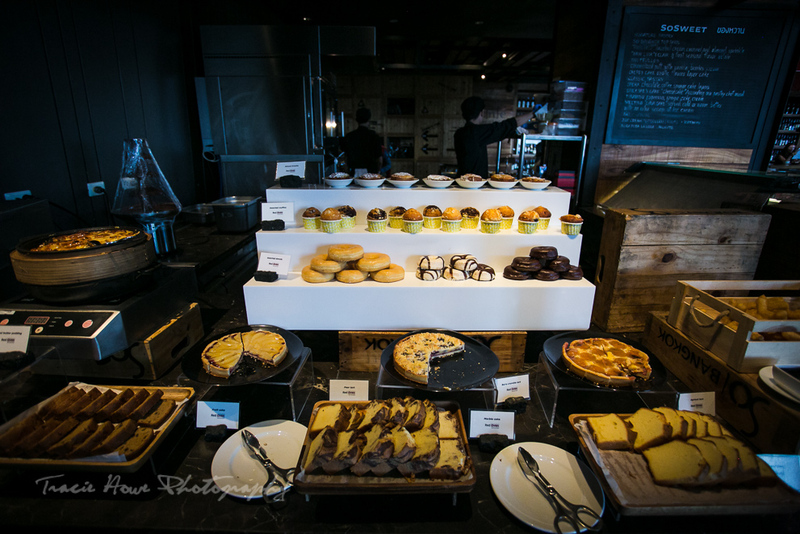 Too many sweets and pastries to eat for breakfast… although I did try to eat as much as I could! The Red Oven restaurant at breakfast. A wide selection of international breakfast foods. A delicious cappuccino and the first round of food at breakfast. 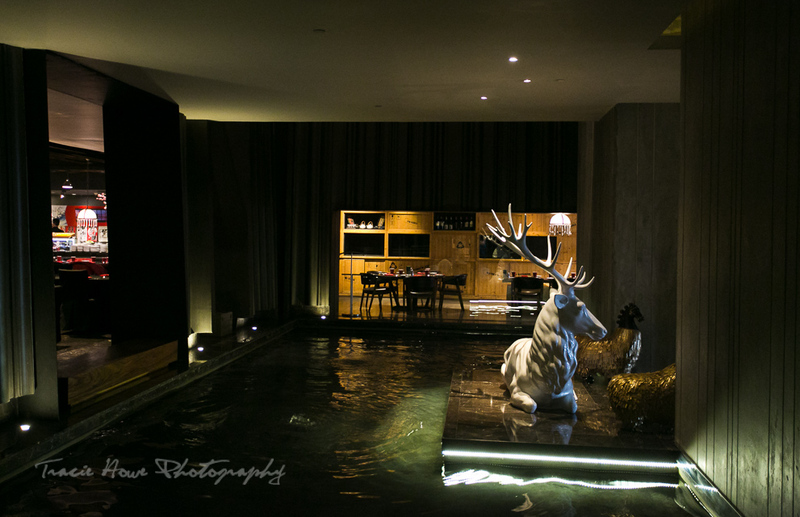 Overall I was thoroughly impressed with Sofitel So Bangkok. 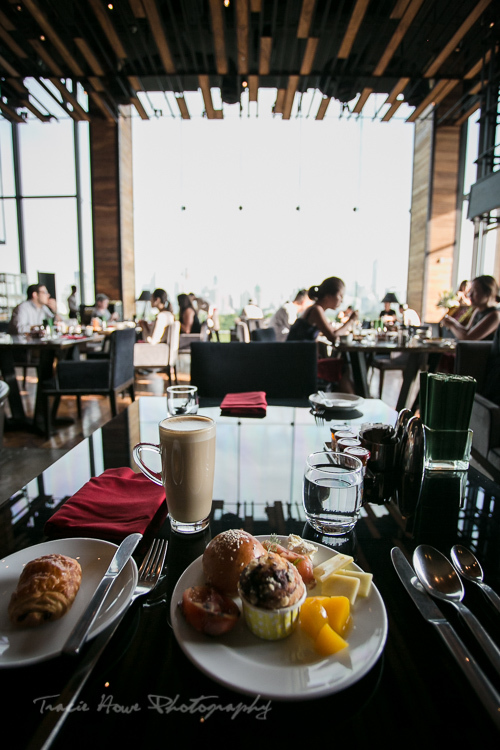 Frankly, my expectations are hardly ever exceeded, but Sofitel So Bangkok did just that. The staff was super helpful and friendly, despite my sometimes rugged backpacker appearance. I found the hotel to be conveniently close to the Lumphini MRT station (Bangkok’s metro/subway), which I made use of often once I realized how close it was. The food and drinks that I had were delicious, in particular a little VIP treat left for me in my room. What impressed me the most was probably the amount of thought put into every detail of the hotel design, offering a unique approach to luxury without compromising comfort. 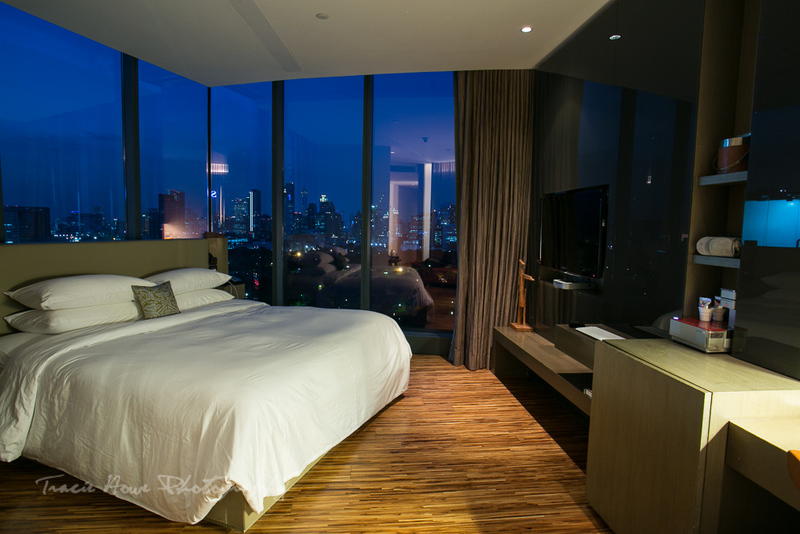 This is no cookie-cutter hotel in Bangkok, but rather an attraction in itself that Bangkok offers. Chris - Wow, forget Flashpacker, you’ve graduated from that already by the looks of it!